In The Darkest Minds, the children are diseased. Some drop dead for no apparent reason before they reach the age of ten. Those that don’t begin to develop abilities they don’t understand, and can’t control. Some merely gain superior mental acuity, excelling at math and science far beyond their years. For others, their abilities take on a more dangerous shape–telekinesis, electrokinesis, mind reading, mind control. After waking the morning of her tenth birthday to parents with no memory of her existence, Ruby is taken to Thurmond, a Rehabilitation Center she soon finds is much more like a concentration camp. The children are separated by their abilities, watched and controlled every hour of every day. They are not allowed to speak to one another, to play, or to go to school. Their days consist of nothing but meals, and menial labor. Ruby manages to escape Thurmond, and by chance meets up with a group of runaways, just like her. Liam, who is a Blue–a telekinetic; Charles “Chubs”–a Green problem solver; and Zu, a Yellow who can create and control electricity. Together, they travel in search of East River, a fabled camping ground where other kids with abilities have managed to make a life for themselves, under the radar. Of course, this journey is not without obstacles, and if they find East River, will it really be the Promised Land they’re looking for? The Darkest Minds reminded me a bit of a cross between Unwind and Shatter Me; teens with supernatural abilities, who must run from adults who seek to harm them. It was exciting, and very well paced; tense, but not without moments of humor (and swoon!) that kept it from being overwhelming. And I appreciated the questions raised–is anything inherently good or bad, or does intention weigh more than an act itself? I very much enjoyed The Darkest Minds, but I will warn you–my initial review said only: WORST ENDING EVER. I wouldn’t necessarily categorize it as a cliffhanger, but it did leave me emotional and wishing for the next book immediately. The Darkest Minds is out December 18th, 2012. 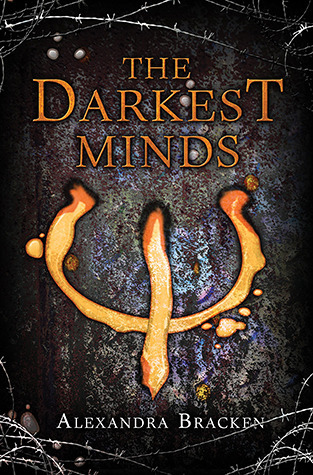 Win an ARC of The Darkest Minds! This title won’t be out until mid-December, but thanks to our friends at Disney*Hyperion, we have an advanced copy to give away to our readers. All you need to do is fill in your contact info in the form below and leave a comment on this post. This contest is open U.S. and Canadian residents aged 18 and older (or 13 and older with parental permission). I just added this one to my TBR pile this morning, but I think I’ll read Shatter Me first. I’ve heard great things about it. I’ve been waiting for this book for months and now I’m starting to see all the reviews coming in from people who got ARCs and it’s making me even more excited! I love stories about people with super-powers. Especially when they’re young and just coming to terms with their powers and what that means for their futures, their relationships, and their responsibilities towards other people. I can’t wait to read this. Thanks for the giveaway! I hope it isn’t too much like Shatter Me because I didn’t really enjoy that book! Great review. This book sounds exciting and really dark. I can’t wait to read it! It is both of those things. I hope you enjoy it when you get the chance to read! This one seems to be racketing up the legion of fans. Kara gave it a good rating, and a Midnight Garden giveaway seems indicative of a good novel, as well! I love the idea for this – even if it’s another series – and can’t wait to see what Bracken does with her book! I hope it gets some good buzz, I enjoyed it so much. I’m always wary of a series, but hopefully Bracken is able to keep my interest throughout the next two books. I am so excited about this book! It is definitely one on my Christmas wish list this year. Thanks for the opportunity to read it sooner! This book looks fantabulous ^_^ I hope it can match the dark and beautiful Shadow and Bone or The Child Thief. I haven’t read The Child Thief, but I would say this has a very different feel than Shadow and Bone. It’s less fantasy driven, though it does have its dark moments. This book looks fantabulous 0_0 I am craving for a dark demented book that matches Shadow and Bone or The Child Thief. I read Alexandra’s last book and liked it well enough, but this def seems more my speed! Can’t wait to this one. I haven’t read her other work, but I’m definitely inspired to check it out now. :) I hope you like The Darkest Minds better! I really want to read this book now. Thanks for the giveaway and interview. Isn’t it funny how that works? Sometimes I think they should do away with synopses, and just give us passages from the books instead. Shapeshifting would be a really cool power. I’d probably change into a turtle, haha. I’ve been fascinated by the premise for this one, but I’m always a little bit frightened of how an author may choose to approach something like this. This sounds like it’s all Ruby’s POV? I hope so. I wasn’t a fan of “Unwind” overall, but the headache that was every character and their dog’s POV just clinched it for me. But anyway. Swoon. Superpowers. I’m there. Yep, all one POV. Truthfully, I haven’t finished Unwind yet, mostly because while I’m really interested in the story, the writing is so flat (and jumps around so much) I can’t seem to get invested in the characters. The Darkest Minds doesn’t follow the same style, but there are elements of the story that reminded me of Unwind. Well since I read both Unwind and Shatter Me and LOVED them, I really hope I win this book, so I can add it to my list of loved books! Haha. thanks for the giveaway! You’re welcome! I hope my comparisons stand up to your love. ;) Good luck! Oh it sounds nice, I didn’t know this one, thank you! You’re welcome! I’m glad I could introduce you to something new. Good luck in the giveaway! Ahh, I am ridiculously excited for this book, I can’t even right now. It just sounds like something I would totally fall heads over heels in love with. Just the concept, the whole prison thing, to supernatural powers- everything in this book is a combination of what I love to see in a book. So I think that I will seriously enjoy this book! I love the whole paranormal culture, and I loved Shatter Me when I read it, I can not wait for the 2nd book to come out. This looks like it will be a great read! I love the whole paranormal culture and this looks like a great read. I did enjoy Shatter Me and I can not wait until the 2nd book comes out. I love stories where people have supernatural abilities and when you get questions like “is anything inherently good or bad, or does intention weigh more than an act itself” being raised, that’s just a bonus. Thanks for the giveaway! Teleportation would be the most amazing gift, I think. Time for grabby hands!! Want! I’m excited about this one because the story sounds unique and different. If I had a superpower I think I would like it to be reading people’s minds and being able to alter their thoughts. I don’t know if I’d want to know what’s going on in peoples’ minds–knowing me, it’d be super embarrassing, haha. Oh man. Is flight an option? I’d love to be able to fly. And yay! This book sounds so good. The cover didn’t do a thing for me, so I’ve ignored it, but after this review? To the TBR list it goes. Being able to fly would be at once terrifying and wonderful, I think. Have you read Daughter of Smoke and Bone? The flight scenes had me so tense, and jealous at the same time. My superpower would be rather boring, just perfect memory so I’d never forget anything. Looking forward to this book in December! That would be awesome. Except there are some things I wish I could forget… like that really embarrassing moment in 8th grade… haha. Hope you get a chance to read soon! Honestly, I didn’t pay much attention to this book until your review. It sounds sooo good though! Ha – I haven’t read Unwind or Shatter Me yet. I guess I’m way behind on these books. This one sounds very intriguing! It was! It definitely made me ask myself questions as I was reading. I had my eyes on this book for a long time, and this review made me want to read it even more! WOW! This book sounds good. I will so have to pick this up. I loved your review :) Very intriguing. Ack! I’m so nervous that the ending of this one will have me IN A RAGE. We shall see–I’m still going to read it as I have an ARC, but I appreciate the caution. For me, the ending was less RAGE and more *whimper*, haha. I hope you end up enjoying it! Yay! This has been on my to-read list since I saw the author speak on a panel at NYCC last month! This sounds like a great book, like nothing I’ve ever read before! Thanks for the chance to win!!! Is anything inherently good or bad, or does intention weigh more than an act itself? And that’s the sentence that has convinced me I would enjoy it. I confess I wasn’t sure this was the book for me, but seeing your excited reaction to it has persuaded me that I need to give it another try! I hope you like it if you happen to try again! I’ve been on a supernatural kick lately so I’m excited based on the review! If I could have a superpower it would for telekinetic powers, but that would make me lazy huh? So maybe mind control? Yes that sounds like one for me! I feel like I would get myself in so much trouble with either of those… I’d much rather the ability to be invisible. I’m totally Violet from The Incredibles, haha. I am reading this myself and really enjoying it. I am also totally preparing myself for the rotten ending. And the next book is sooo far away! Glad you enjoyed this one. Great review. 2013 feels like foreeeeever away. Ugh! Had this book on my radar for like ever considering Alex Bracken’s books are impossible to find in my town. I’ve heard her writing is lovely, so I’d love to experience it and Darkest Minds just sounds fantastic. I’ve never read anything else from her, but I’m definitely going to be checking out the rest of her works, now. Haha, I’m so happy I could bump it up your list! Hope you enjoy it when you get to it… and good luck in the giveaway! Super powers! Sounds awesome. I’ve had my eye on this book. Hope you enjoy it when you read! Well, if I loved Unwind and Shatter Me then I’m sure to really enjoy this read!! I’m always torn about the super power….Telekinesis sounds really useful. But then I think of compulsion and how THAT could be really useful….or like Storm powers…because you know, mother nature for the win! Yes, Storm’s powers would be seriously cool. Telekinesis would be fun since I’m lazy, but I think more than anything I’d like the ability to be invisible. Thank you! I haven’t read Brightly Woven, but I’ll definitely be checking it out now. She’s a fabulous writer. I don’t think it’s really a cliffhanger; you’re definitely left wondering what’s going to happen next, but it’s not a sheer dropoff like some other books. Just kind of a sad conclusion. I hope you like this one more than your recent disappointing read! I really loved Shatter Me, so any comparison is going to pique my interest. If I had a super power, I’d really love being invisible. Or no! Being able to teleport. No more airports. No more traffic. Instant gratification. Teleportation would be AMAZING. I have so many friends scattered across the globe. It would be great to just beam myself to them. Someone needs to work on that ability. Haha, it’s the plight of a YA reader, I guess. I can’t seem to stop myself from starting series, even if I get annoyed with the wait between installments. Hope you like The Darkest Minds when you get a chance to read it! I really want to read it since you said it’s like a cross between Unwind and Shatter Me. :D I love both of those books, and The Darkest Minds sounds amazing!! It definitely has some elements in common with both Unwind and Shatter Me. I hope you enjoy it when you have a chance to read it! The Darkest Minds sounds cool — I love books about kids with supernatural abilities. BUT, BOOOO to cliffhanger endings! Thank you! I don’t really think it’s a HUUUGE cliffhanger. Just a bit of a sad ending. I have an intense and abiding love for stories about people with superpowers and for stories about kids who run away. And I liked Unwind. Thanks for the ending-warning. I’d hate to have come across that unprepared. I keep tryign to leave a comment — let’s see if this finally works. Anyway, I’ve been looking forward to Bracken’s next book since I’ve read Brightly Woven and I’m so glad the time is finally here. Your review makes it sound excellent. I think it’s interesting that she relied on color groupings again for the different powers. I haven’t read Bracken’s other work, but I’m definitely looking forward to it now. It definitely has a little bit of an X-Men feel, which I hope is perpetuated in its sequels. After reading a few reviews for Darkest Minds I realize it’s not at all what I was expecting it to be. I’ll have to get to it soon. Shatter Me was one of those books that really excited me when I first read, but did not stand up to the second read. I agree The Darkest Minds was a stronger story. And that ending. UGGGHHHH. Is it next Fall yet? ?